2014 Software 500. Security, telecom services, and healthcare are strong sectors; Apple moves up; IBM still top employer.. 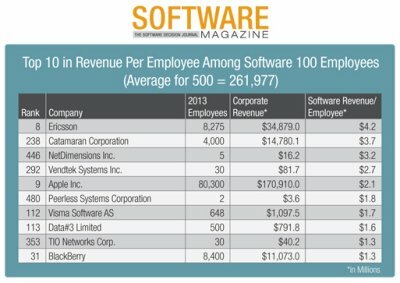 Overall revenue for the 2014 Software 500 companies reached $717.7 billion, up 7.1% from last year’s $670.2 billion, according to findings of the 2014 Software 500 ranking of the world’s largest software and services companies, now in its 32nd year. 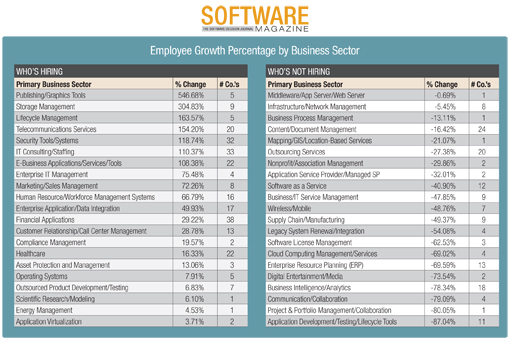 The total number of employees in the Software 500 declined slightly to 4,884,000, down 1% from 4,924,121 in last year’s survey, perhaps reflecting a maturing of the overall industry. 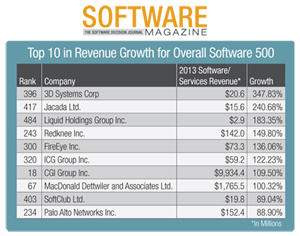 Average growth in license and service revenue for the 2014 Software 500 companies was 11.6%. The top 10 ranked companies saw changes this year with IBM and Microsoft retaining rankings No. 1 and 2; Oracle moving up to No. 3; Accenture moving up to No. 4; and HP down to No. 5. 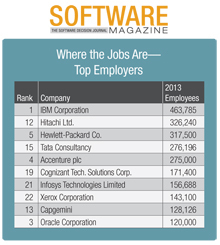 EMC and SAP again are ranked No. 6 and 7; while Ericsson moved into the top 10 as No. 8; Apple makes its first appearance in the Software 500 top 10 as No. 9; and NTT Data moves down to No. 10 from No. 8 last year. Growing most dramatically in the top 10 is Apple, with 25% revenue growth in the ranking year of 2013 to reach $16.1 billion in software and services revenue. Last year, the company ranked No. 38 with $3.5 billion in software and services revenue. IBM continues to be the top employer in the Software 500, but the company’s head count was reduced to 463,785 from 466,995 the previous year. Second was Hitachi, which increased its head count slightly to 326,240 from 323,540 the previous year. 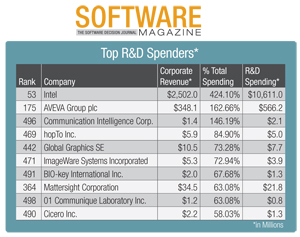 The average research and development investment for the entire 2014 Software 500 was 13.4% of revenue, up from last year’s average of 12.7% of revenue, indicating attention to technology at the heart of the software business. Employment growth shifted into telecommunications services, including 20 firms, 154% employee growth; security tools and systems, including 32 firms, 119% employee growth; IT consulting and staffing, including 33 firms, 110% employment growth; and e-business applications (apps) and services, including 22 firms, 108% employee growth. The number one growth leader in companies with software and services revenues over $1 billion is CGI Group, ranked No. 18, with growth of 110% in the measurement year. Unfortunately for CGI, its federal unit was not renewed as chief contractor for the Healthcare.gov federal Web site in January 2014. The Obama administration signed a 12-month contract with Accenture at that stage. Despite the setback, CGI Federal has since won a number of U.S. government contracts, including with the Department of Homeland Security and the GSA. Next topping the growth charts at companies over $1 billion is MacDonald Dettwiler and Associates Ltd. (MDA), ranked No. 67, focused on communications, surveillance, and intelligence services, with commercial and government customers. MDA has more than 4,800 employees, primarily in Canada and the U.S. MDA grew at 100% in the measurement year, assisted by the acquisition of Space Systems/Loral, a transaction that closed in November 2012. Today MDA’s customers include NASA, DARPA, the Asia Satellite Telecommunications Company Limited, the U.S. National Geospatial-Intelligence Agency, and the Canadian Space Agency. Also notable for growth among companies with over $1 billion in revenue is SCSK Corp., No. 52, growing 45% to reach $2.6 billion in revenue. SCSK is a global IT services company formed by the merger of Sumisho Computer Systems Corporation and CSK Corporation in October 2011. Also Constellation Software, No. 91, growing 39% to reach $1.1 billion; salesforce.com, No. 35, growing 34% to reach $4.1 billion; Cognizant Technology Solutions, No. 19, growing 20% to reach $8.8 billion; and Red Hat, No. 74, growing 16% to reach $1.5 billion. Among companies with between $100 million and $1 billion in software and services revenue, the growth leader is Redknee, No. 243, with growth of 150% to reach $142.1 million. The telecommunications services provider’s subscriber management platform offers converged charging, billing, policy management, and customer care solutions for over 200 communications services providers. In 2012, Redknee acquired Nokia Siemens Networks business support services division. Next in the growth category is Palo Alto Networks, No. 234, growing 89% to reach $152.4 million in revenue. In a recent contract win, CAME Group, an Italian holding company, standardized on Palo Alto’s security products and was able to eliminate the cost of 50 IT consultants, saving an estimated $2.5 million annually. Tableau Software, No. 207, grew 82% to reach $232.5 million. The business intelligence/analytics software supplier was recently named by the IT analyst firm Gartner among the top business intelligence vendors worldwide. The recently announced Tableau 8.2 adds features including data-driven narratives called story points, connectivity to Microsoft Excel spreadsheets with over 255 columns, and new map designs. ServiceNow, No. 149, grew 74% to reach $424.7 million in software and services revenue. ServiceNow is a platform as a service provider of IT service management software. A recent survey conducted jointly by the company with KPMG, found that 93 percent of IT management respondents said the role of IT is changing from being an administrator of infrastructure to becoming a driver of enterprise services. Avigilon, No. 226, grew 72% to reach $173.1 million in revenue. The company designs, manufactures, and markets video surveillance software and equipment. A recent release of the firm’s Access Control Manager product extends functionality for customer companies with up to 32 entry doors. Avigilon was founded in 2004 in Vancouver, BC, Canada. Workday, No. 142, the workforce management company founded by PeopleSoft founder Dave Duffield, grew 71% to reach $469 million in revenue. Advanced Computer Software, No. 187, grew 70% to reach $309 million in revenue. The company provides software and IT services to the public, private, and not-for-profit sectors. The Advanced Health & Care unit of the company recently won a contract with Sussex Partnership NHS Foundation Trust, one of the biggest mental health service provider organizations in the U.K. Sussex purchased Carenotes, a patient information system from Advanced Health, to be rolled out to 5,000 staff members over the next two years. Splunk, No. 188, grew 52% to reach $302.6 million in revenue. Focused on operational intelligence and analysis of big data, the firm recently lowered prices up to 33% for its Splunk Cloud offering. Splunk Cloud is now available in the U.S. and Canada starting at $675 per month for up to 5GB/day of data indexed. Among companies with between $50 and $100 million in revenue, the leader is FireEye, No. 300, growing 136% to reach $73.3 million in software and services revenue. FireEye provides threat forensics and malware protection against advanced persistent threats and spear phishing. The FireEye platform incorporates a virtual execution engine, complemented by dynamic threat intelligence that works to identify and block cyber attacks in real time. Marketo, No. 280, grew 64% to reach $96 million, with its marketing automation software catching on. Trintech, No. 321, grew 39% to reach $59 million in revenue on the strength of its products for account reconciliation, bank reconciliation, journal entry, compliance, financial close, and financial reporting. SciQuest, No. 285, supplier of cloud-based business automation services for spend management, grew 36% to reach $90.2 million in revenue. Rally Software Development, with its enterprise software tools aimed at driving business agility, grew 31% to reach No. 298, with revenue of $74.4 million. Among companies with between $30 and $50 million in revenue the leader is WorkForce Software, offering workforce management software for large employers, reaching No. 334 with growth of 67% to reach $48.3 million. Next is BlackLine Systems, No. 357, growing 46% to reach $36.6 million, offering visibility and control over the financial close, with account reconciliation software. Jag ged Peak, No. 338, grew 28% to reach $47.5 million, based on increased popularity of its outsourced ecommerce and supply chain support products. BlackDuck Software, No. 352 with 23% growth to reach $42 million, provides consulting and software to enable enterprise adoption of open source software. Among companies with $10 to $30 million in revenue, the growth leader is 3D Systems Corp., specializing in 3D printers, 3D imaging, and customization software. 3D saw 348% growth to reach No. 396 with revenue of $21 million. Jacada, No. 417, supplying products to support interaction with customers, grew 89% to reach $19.8 million. SoftClub, No. 403, grew 63% to reach $14.8 million. SoftClub is a group of companies in eastern European countries including Russia and the Ukraine, with customers in banking, finance, and the public sector. Miratech, No. 405, an outsourcing provider headquartered in Sweden, grew 33%. The company’s development organization has achieved the Software Engineering Institute’s CMM Level 3 certification. The telecommunications services business sector saw an employee growth rate of 154% compared to last year, with 20 firms employing a total of 105,802. The leader in the category is Ericsson, No. 8, with growth of 3% and revenue of $16.8 billion. In two recent contract wins, Ericsson was selected by Vodafone India to deploy its Charging System to 75 million prepaid customers, offering services such as real-time balance notifications, and self-service plan adjustments. The five-year agreement calls for Ericsson to replace a legacy infrastructure. In another recent win, Ericsson was selected by Telefonica VIVO to bring next-generation television to Brazil. The Ericsson AVP 4000 is based on the company’s first-ever video chip, which enables broadcasters to achieve greater velocity in deploying new video services. Juniper Networks, No. 28, saw growth of 7% to reach $4.7 billion in software and services revenue. Global footwear manufacturer, Nike recently selected Juniper to help it create its highly scalable, next-generation data center cloud and retail network infrastructure. Juniper’s MetaFabric architecture will be the basis of virtualized data center worldwide. Additionally, global financial services firm UBS has selected Juniper to help build its next-generation data center network infrastructure. Juniper will employ the routing, switching, and security features of MetaFabric’s open architecture to support current and future business goals. Tangoe, provider of connection lifecycle management software for mobile, fixed, cloud, social, and IT users, reached No. 219 with growth of 22% to reach $189 million in software and services revenue. Tangoe recently signed a partnership agreement with Samsung to provide the Samsung KNOX mobile security product to Tangoe’s global enterprise customers supporting Samsung mobile devices. The KNOX container creates a secure zone on the employee’s device. Tangoe also recently announced its Bring Your Own Device Advisory Service, providing a team of experts to assist customers with implementation of a bring your own device model. 8×8, provider of cloud-based unified communications, saw growth of 25% to reach No. 278 with $98.2 million in revenue. The engineering and architecture firm Barge, Waggoner, Sumner, and Cannon recently deployed 8×8 Virtual Office services to 400 users in its Nashville, TN headquarters and other U.S. offices. The product allows employees to make and receive calls on their smartphone using the 8×8 mobile app, which makes it appear as if they are using their office phones. 8×8 also recently reached a partnership agreement with Telecom Brokerage (TBI), a technology service provider, allowing TBI’s 2,000-plus agents to offer 8×8’s communications services to TBI customers worldwide. The security tools and services business sector saw employee growth of 119% to reach 215,514 employees in 32 firms. The category leader again is Symantec, with growth of 3% to reach $6.9 billion, No. 23. In product trends, Symantec recently reported a mobile product development surge focused on providing secure access to mobile apps, content, and devices, as well as business email protection. Also, recent enhancements to Norton Small Business, for firms with 20 or fewer employees, are focused on cybersecurity. Features include guaranteed virus removal, mobile device protection, easy management and prices of $99 annually for five devices, $199 for 10 devices, and $399 annually to protect 20 devices. Gemalto, a leader in digital security headquartered in Amsterdam, grew 10% to reach No. 45 with $3.2 billion in software and services revenue. The company recently announced plans to acquire SafeNet, a leader in data protection and software monetization, which in 2013 had revenue of $337 million. In a recent contract win, Gemalto was selected by China Telecom to support the commercial rollout of mobile services; China Telecom has more than 183 million subscribers. Also, Gemalto recently won a multi-year contract to supply ePassports to the government of the Republic of Moldova. The product will enable visa-free travel for Moldovan citizens to the European Union. Fortinet, a leader in high-performance network security, grew 20% to reach No. 181 with $330 million in software and services revenue. The Spanish hotel chain PROTUR Hotels recently selected Fortinet’s technology to secure its wireless networks in all of its establishments. The hotel chain implemented Fortinet’s firewall appliances, thin wireless access points, and a logging, analysis, and reporting appliance. Fortinet also recently announced enhancements to its Web Application Firewalls for Amazon Web Services (AWS), to include on demand, pay-as-you go offerings. FortiWeb-VM for AWS can now be utilized on an hourly or annual subscription basis, complementing existing bring-your-own-license options. Imperva, offering data center security products, reached No. 247 with $138 million in revenue and growth of 32%. Imperva’s Skyfence unit for controlling cloud apps recently announced a version of Skyfence Cloud Gateway to address blind spots and security gaps created by the adoption of unauthorized cloud apps. Skyfence is architected to enable the save and production use of apps such as GoogleApps, NetSuite, Office 365, and salesforce.com by monitoring activity, assessing risk, and protecting data in the cloud. Linoma Software, provider of secure file transfer and encryption products, reached No. 465 with revenue of $6.1 million and growth of 26%. Linoma was recently added to the General Services Administration list as a Schedule 70 contractor, with its GoAnywhere product. The GoAnywhere Managed File Transfer suite offers secure data exchange, secure file hosting, and a reverse and forward proxy gateway that protects server identities and user passwords. The healthcare business sector saw employee growth of 16% to reach 101,016 employees in 22 companies. The leader is McKesson Corp., No. 44, with software and services revenue of $3.3 billion and growth of 4%. McKesson delivers pharmaceuticals at a retail level and provides health information technology, medical supplies, and care management tools. In a recent win, Premier Medical PC, a 12 physician group providing emergency medical services for St. Vincent’s East Hospital in Birmingham, AL, selected McKesson Business Performance Services to reduce overhead, improve coding and billing, and strengthen financial and clinical reporting. Premier Medical handles about 53,000 emergency visits annually at St. Vincent’s East. In another win, Gonzales Healthcare Systems in Gonzales, TX, selected a range of medical imaging products from the company. Following a competitive evaluation, the hospital chose McKesson for the ability of its products to integrate patient data, test results, and images. Gonzales operations a 34 bed acute-care community hospital. Cerner Corp., No. 48, a global supplier of healthcare IT products and services, grew 9% to reach $2.8 billion in revenue. Cerner recently announced the acquisition of the health IT business unit of the German industrial conglomerate Siemens AG for $1.3 billion in cash. The move positions Cerner, a provider of electronic medical records products, to tap rising spending on software by hospitals and doctors. As part of the agreement, Cerner and Siemens enters into a strategic, three-year alliance building on Cerner’s health IT business and Siemens’ medical devices and imaging. Elsewhere for Cerner, Via Christi Health of Kansas is implementing an $85 million electronic health records system to allow providers and patients faster access to their records. The system is a pilot program for Ascension Health, the nation’s largest non profit and Catholic healthcare system, which acquired Via Christi last year. The system, called OneChart, serves all of Via Christi’s Wichita hospitals and clinics. Healthstream, No. 252, grew 28% to reach $132 million in revenue. The company offers software as a service products for training and learning management, talent management, performance assessment, credentialing, and managing simulation-based training programs. Results Physiotherapy, operating in six states, recently selected the firm’s OneApp product to speed the time it takes to check credentials of physical therapists. Rapid City Regional Hospital in SD recently chose the OneApp product to transition from a paper-based process to an electronic process. The benefits have included reduction in receivables, and higher physician satisfaction. Benefitfocus, No. 269, a company offering online benefit enrollment support, grew 28% to reach $105 million in revenue. ALCO Stores, a TX-based retail chain, recently selected the firm’s products to support benefits administration in response to additional requirements impose by the Affordable Care Act. Also, Kent Corp. recently adopted the company’s products to support benefit enrollment for its dispersed workforce of more than 1,600 employees. Based in Muscatine, IA, Kent has operating subsidiaries involved in corn wet milling, animal feed production, and the manufacture and sale of food products.